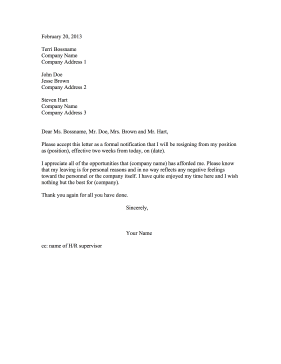 This resignation letter shows the proper format for addressing multiple people when leaving a position. Please accept this letter as a formal notification that I will be resigning from my position as (position), effective two weeks from today, on (date). I appreciate all of the opportunities that (company name) has afforded me. Please know that my leaving is for personal reasons and in no way reflects any negative feelings toward the personnel or the company itself. I have quite enjoyed my time here and I wish nothing but the best for (company).